Like many small business owners, Chris Iousa is wondering if it’s time to call it quits on Facebook. Chris has put in the work to grow his Facebook following to over a thousand fans. He regularly posts updates about brunch specials, new craft beers, and open mic nights at his café. When someone searches for Chris’s café online, his Facebook Page serves as a visible online community, fully equipped with photos, business information, and a look at how the café communicates with its customer base. Email marketing gives you the power to reach your contacts on your own terms. You can send a message to your contacts directly and track your results to see which contacts are engaging with your content. So, how do you get people to take the next step and join your email list? It only takes a minute to connect it to your Business Page, and you can customize the form with your logo and a quick introduction to let your audience know what they’ll receive. Set up the Join My Mailing List App now! Start with one of these 15 ideas for your cover photo, and then add some text to let fans know they can stay in touch through email, as well. 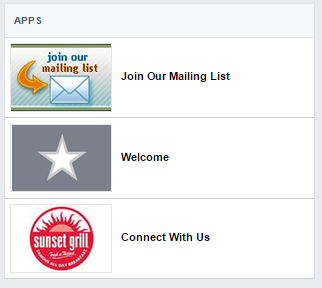 Give Facebook fans an incentive to share their email address by running a contest on Facebook. Start by choosing a product, service, or opportunity you can give away — this could be anything from a coupon, gift basket, or free ticket to an upcoming event. Then, make it easy for your fans to enter. You can simply collect names and email addresses to choose a winner at random, or ask your fans to provide an entry relevant to your business. Anything from a downloadable guide on cloud computing to a link to a top secret recipe could be just the incentive your audience needs to give you their contact information. Here’s a great example from Donna Moritz of Socially Sorted. She offers a guide on visual content in exchange for contact information. Make sure you’re collecting email addresses during the registration process. Here’s how Cynthia Sanchez promotes a webinar through her Facebook Page. What better way to persuade your Facebook fans to sign up for your list than to show them what your mailings actually look like? Brandon Stewart promotes his monthly newsletter, where Facebook fans can share it with their own audience. If you’re wondering how Facebook can have a bigger impact on your business, make sure you’re giving your fans additional ways to connect with you through email marketing. Pick two of these tips and try them out for your business today! If you’re already a Constant Contact customer, you can access our email sign-up tools within the Contacts section of your Constant Contact account. Not a Constant Contact customer? Try us free for 60 days! Editor’s Note: This post was originally published in July 2015 and has been updated for relevancy and accuracy.